Societal systems are more and more reaching their limits: we face the important challenge of meeting both our present and future needs within the capacity of our planet. 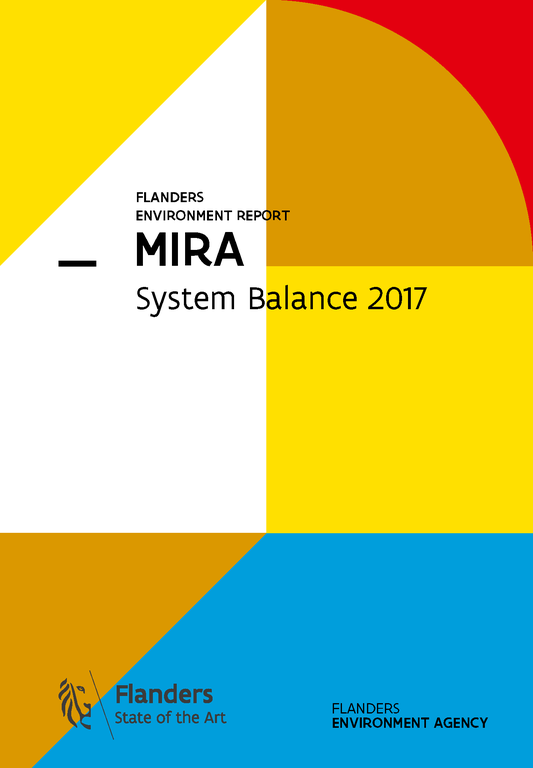 In the new MIRA publication "System Balance 2017", we examine to what extent the energy, mobility and food systems in Flanders are in environmental balance and what system changes are needed. This new MIRA publication is part of the assignment to describe and analyse the state of the environment in Flanders and is complementary to the 200 or so environmental indicators that can be consulted on the website of the Flanders Environment Report (MIRA), www.milieurapport.be. Although the energy intensity of Flanders – this is the amount of energy needed per unit gross domestic product – is 23 % below the level recorded in 2000, Flanders clearly remains more energy-intensive than its neighbouring countries. Fossil fuels still account for three-quarters of the energy supplied to households, industry, transport, agriculture, trade& services, as compared to one-fifth for electricity. However, advanced electrification of energy consumption results in reduced environmental pressure, especially when electricity is generated through renewable energy sources. The bulk of energy end use in Flanders goes to climate control and hot water (31 %), industrial process heat (30 %) and transport (24 %) (the remainder goes to electrical devices and lighting). Despite the significant decrease in emissions of air pollutants such as nitrogen oxides and particulate matter, transport remains a major source of harmful substances for people and the environment. Road traffic emissions in particular are responsible for the environmental pressure from passenger transport. The number of passengers-kilometres of motorised transport (including rail), however, continues to increase. Company cars increasingly contribute to the intensity of road traffic; households with a company car travel more kilometres, both for commuting and for personal business. In recent years, there has been no further modal shift to environmentally friendly travel. Not only environmental problems but also structural congestions indicate that the current mobility system in Flanders is running up against its limits. Like other production and consumption systems, our food system also has a major impact on the environment. Technological progress and increasing knowledge were responsible for a significant reduction in environmental pressure from Flemish agriculture per unit output in the 1990s. Over the last decade, however, the rate of these environmental efficiency improvements has dropped whilst the challenges remain immense, in particular for meeting the European targets for water quality and biodiversity. Also the environmental pressure from food consumption is high, and for a large part originates from outside of Flanders. For greenhouse gases, for example, this is over four-fifths. To make the switch to a low-carbon economy, the societal systems in Flanders need to undergo a real transition. The price evolution of energy sources and techniques, the social acceptance, and the changing international framework are only a few factors that will determine the path of the energy transition. Also the way in which we will or will not adjust our spatial planning over the next decades, will help to determine the final path. However, choices in the energy system need to be made now if we want to get on the right path to reduce greenhouse gas emissions by at least 80 % by 2050. Solutions reside in combining higher energy efficiency, e.g. through the development of heat networks, and further transition to renewable energy sources such as solar power, additional wind energy both offshore and onshore, sustainable production of biomass, etc. Furthermore, such an approach contributes to a higher level of self-sufficiency and a more stable energy supply in Flanders, which does not have its own, economically viable fossil energy sources and uranium. For the mobility system, too, a number of socio-economic developments and technological advances could improve the environmental impact. Examples are the advent of electric bikes and cars, car sharing, teleworking, etc. It is, however, not obvious that this potential is also being used optimally; rebound effects are never far away. Just as with the necessary transitions in the other two examined societal systems, the government has a key role to play here, for example, by developing a widely supported long-term vision, the necessary infrastructure, the right price signals, and a regulatory framework for innovative technologies and new business models. Here, too, we see that spatial planning in Flanders is essential to tackle the mobility issues at source. The extent and geographical scope of environmental challenges call for structural innovations throughout the food system. Changes in production and distribution chains and in individual consumer behaviour should mutually reinforce each other. More sustainable food production, for example, often results in higher costs for farmers. A breakthrough is therefore only possible if the consumer is prepared to pay a price that covers the actual costs and if that price is reflected in higher margins for farmers. Higher margins can also be achieved by paying farmers for ecosystem services such as long-term carbon storage in grasslands. Water, air and the environment. These are the three domains in which VMM is active. Flanders Environment Agency (VMM) covers three main areas: water, air quality and the State of the Environment Report.